Aileron is known for the various types of semi-precious stones found in the vicinity. 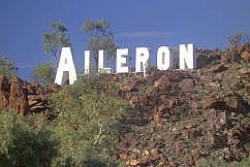 The Aileron area is the site of some recent discoveries of 'rare' earth minerals. The information stand at this oasis on the track has some interesting historical information about this area.